Sweet potatoes are one of my all time favorite foods, seriously. I eat them about every other day. Tossed into a salad, roasted whole and mixed with some ghee and maple syrup, whipped into a frenzy with coconut milk, and now my most recent recipe. 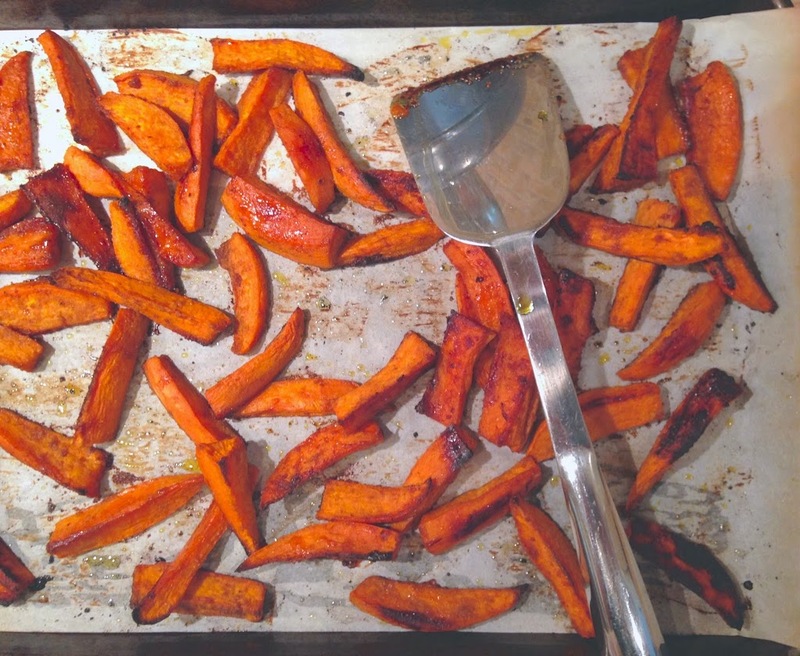 Roasted sweet potatoes have always been a simple go-to in our house and especially for my clients. So this week I did a riff on the regular old sweet potato and added some yummy spice and just a smudge of sugar to it, just enough that it gets a nice crust caramelization while roasting. Plus, it’s a great recipe to build off. I leave you with a few suggestions of how to amp it up even more but let your imagination go wild! After all, it’s summer and we should all be barefoot and crazy…. Forgive the photo, lovelies…it’s been a bit busy around here and I didn’t have my good camera! 1. Cut the potatoes in half, through the thickest part of the middle (not lengthwise) so you and up with two short ends. Cut each end into 4-5 wedges. Toss into a large bowl. 2. Drizzle 2-3 second count of olive oil over the potatoes, you want them to a have a pleasant coating of olive oil. Sprinkle the cumin, sugar, garlic powder and a nice pinch of salt and good crack of pepper on top and, using tongs, toss the potatoes around so they are all coated in the yumminess. 3. Place on a large parchment lined baking sheet and put in a 375 degree oven for 25-35 minutes, tossing once, until they are lightly caramelized and smell divine. These potatoes are delicious tossed with asparagus and then some of my harissa cashew cream for a yummy meal, or if you can eat dairy they are quite lovely when topped with feta and some lemon dressed micro greens.